If you aren’t already addicted to PaleOMG yet, you need to go check it out NOW. Juli, the creator, is hilarious, down to earth, and all of her recipes have been a big hit in our household. 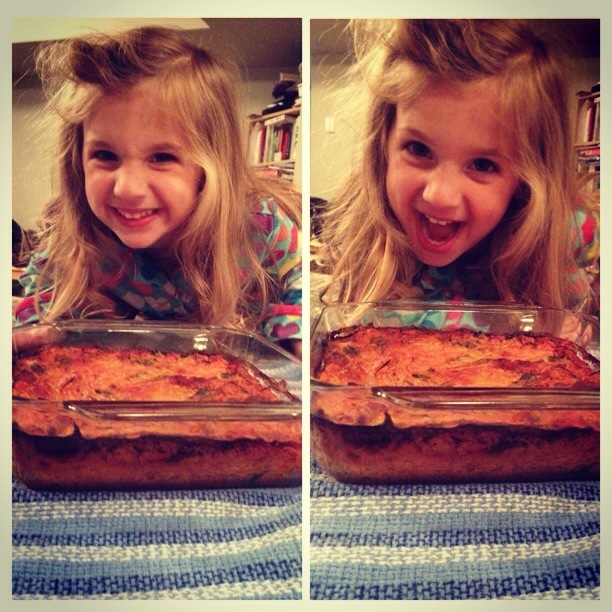 We very slightly tweaked her recipe Almost 5 Ingredient Spaghetti Pie just buy adding some extra vegetables. All credit goes to Paleomg. She’s a genius! 2) Heat a large pan over medium heat and fry the sausage, onions, and green pepper until sausage is cooked through and no longer pink. 3) Add the pizza sauce, basil, mushrooms and spinach and stir well. 4) Combine the entire mixture with the spaghetti squash threads in an 8×8 baking dish. 5) Mix in the whisked eggs until the eggs are no longer visible. 6) Place in the preheated oven and bake for approximately one hour, or until set in the middle. Let it rest a few minutes before serving. Charley had a great time making this with me, but made sure to pick out anything green once it came time to eat it. Baby steps, right?